The cotton industry has developed a Permanent Bale Identification (PBI) system that enables a unique number and standard barcode to accompany a bale of cotton from the gin to the textile mill. This system includes recommended specifications for the bale tag format, which were adopted by the National Cotton Council (NCC). The 1997 NCC delegate resolution defines the PBI system, including a 12-digit, unique permanent bale identifier based on the gin code/gin bale number for every bale and a standard tag format. This document is intended to provide you with the details of the PBI system as well as define AMS requirements for the Classing Identification Coupon, which accompanies the tag placed on the bale by the gin. The PBI number will include the gin code and gin bale numbers as a single, 12-digit number, which will be displayed in both a barcode and an eye-readable format on the bale tag. The 5-digit gin code component of the PBI number will continue to be assigned by USDA. The 7-digit gin bale component of the PBI number will be determined by the individual gins (and in some cases the warehouses). However, it is important to note that, in order to avoid duplicate numbers across multiple crop years, gins will not be able to repeat their numbering series each year. To ensure that no duplicates exist, AMS will monitor PBI numbers in five-year cycles. A. Color: The Tag and Label Manufacturers Institute (TLMI) colors of CSU white, salmon, and buff are acceptable, with white being preferred. Orders for the TLMI colors DIP yellow, green, blue, and orange must be approved by the Chief, Grading Branch, before printing. B. Ink: Non-smearing black ink. Printing of tags on dot-matrix printers is prohibited. C. Thickness: Must be .013 to .015 inches for necessary durability and usability. Other thicknesses or constructions must be approved by the Chief, Grading Branch, before printing. D. Barcode: Must be code 128 subset C that incorporates a check digit, minimizing misreads. Directly to the left of the traditional tag hole is the "USA" designation. On a separate line below the tag attachment hole are the words "Permanent Bale ID" identifying it as the permanent bale identification tag. The next line contains two fields – the words "Gin Code" followed by the 5-digit gin code number; and the words "Gin Bale" followed by the 7-digit gin bale number. The next line contains the barcoded, 12-digit PBI number (gin code and gin bale number) using code 128 subset C printed with a 25 mil. narrow bar width, creating a barcode measuring 1.0" x 3.0". There should also be a minimum of 0.25" white space on both sides of the barcode. Following the barcoded number is the 7-digit gin bale number printed in large 1" high format. The .03" below the number should be used for the gin name. The 2.0" space is for internal business use by gins, warehouses, and mills. This is intended to allow the application of an adhesive label that can be used to designate bale location, bale category, etc. a. Code 128 subset C barcode containing the 12-digit, PBI number. b. Human readable 12-digit, PBI number. c. A letter designation in the right-hand corner. Coupon "A" is intended for use at the mills during consumption, and coupon "B" is intended for use at the mill during bale receipt. 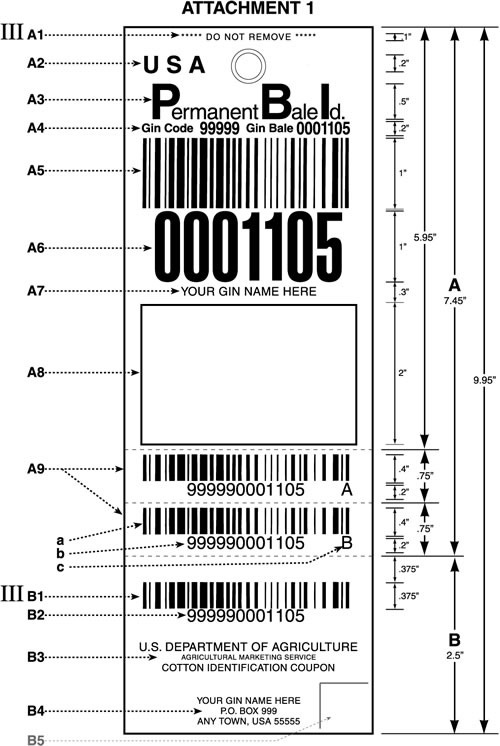 Warehouses who order tags for gins may continue to include a coupon containing the warehouse code (6-digits) and the bale number (7-digits) as separate barcodes. This information may be necessary for the coordination of shipments. Will include code 128 subset C barcode containing the 12-digit, PBI number which will be positioned 3/8 inch from the top edge of the coupon, not exceeding a 1/32-inch variance. The vertical lines of the barcode shall be a minimum of 3/8 inch in height and the barcode itself a minimum of 2 ½” – 3” in width. Will include human readable 12-digit, PBI number with a space between the 5th and 6th digits. Will include name and address of gin. Will be at least 2-1/2 inches in length. The total length of the PBI "minimum" components and the AMS Classification Coupon is 10 inches. Additional coupons necessary for gin and warehouse operations may need to be included. 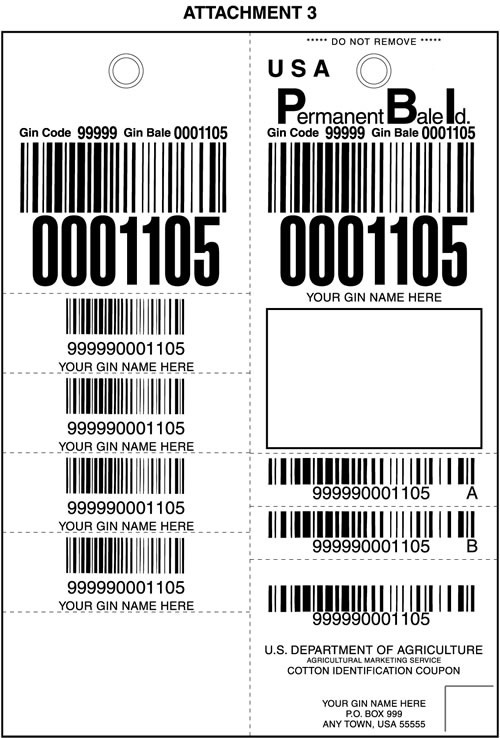 See attachment #2, which is an example of how a gin/warehouse operation might utilize the PBI tag with additional coupons, and attachment #3, which is another example where multiple additional coupons are available for use by the gin.